Minshu is a Chinese translator and Mandarin interpreter based in Hammond, Indiana. She covers the area of southern Chicago as well as northwestern Indiana. 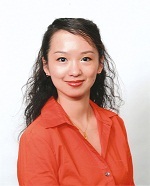 She frequently travels for Chinese translation and Mandarin interpretation assignments in Chicago and is praised by our clients to be one of the best Chinese translators in greater Chicago area. Please see below for her information. - Certified Mandarin/English translator/interpreter proficient in facilitating cross-lingual and cross-cultural communications. 1. Medical: regular check-ups; lab tests; gynecologist visits; dental work; mental therapy; emergencies. 3. Court: immigration and naturalization; small claims; bankruptcy. 2. Medical facilitation: early intervention. - Drafting bilingual bilateral project proposals and MOUs, setting up project goal, detailing procedure, timetable, and evaluation standards. - Consecutive interpreting for Chancellor and the Head of Center for International Programs on bilateral conferences; translating agreements, letters, emails, and other key documents. - Facilitating communications in the multilingual and multicultural contexts among parties involving Purdue University faculty and staff, Chinese higher education scholars, Chinese students, etc. - Coordinating with projects implementation, including the ESL (English as a Second Language) program between Purdue University and Changzhou University Town, and the Undergraduate Students Exchange program between Purdue University and Haerbin No.3 Middle School in China, etc. - Initiating and realizing projects evaluation, including questionnaire designing and data analyzing. - Helping expanding Purdue academic foreign exchange programs to include more countries such as India, Chile, South Korea, etc, shortening their “learning curve”. - Introducing successful projects to similar department at other Purdue campuses. - Teaching TOEFL, reading comprehension and writing skills. - Helping hiring and training new candidates for teaching positions. - Participating in planning and designing training materials. - Working as Chancellor’s academic assistant.